Expert marksman Manuel Murillo Sanchez, 63, was arrested by Catalan police on suspicion of plotting an assassination targeting Spanish Prime Minister Pedro Sanchez. The suspect, who works as a private security guard with a gun license, revealed his hideous intentions against Spanish PM Sanchez in messages he posted in a WhatsApp chat group, as reported by daily Publico. After a member of the chat group notified the police, the police officers found a trove of weapons, consisting of 16 long-barreled weapons, including a CETME assault rifle, and 16 shotguns, inside his home during a raid in Terrassa (Barcelona), including several weapons he had illegally modified himself. Spanish media claims Sanchez is an ‘outstanding shooter’ and is a member of a local shooting club, an active participant in competitions. “Arrested a man in Terrassa who wanted to kill the head of the Spanish government Pedro Sanchez,” the spokesperson of Catalonia‘regional police force said on Twitter. According to the police report, the suspect planned the assassination in retaliation of the Socialist Party government’s plan to exhume the remains of former right-wing military dictator Francisco Franco from a vast mausoleum near Madrid. Murillo Sanchez had no prior record for criminal offences but was alleged to have frequented far-right side environment. Police informed the local media he was the perfect lone wolf and was capable of carrying out his plans as he didn’t arouse suspicion by carrying a pistol because he needed it for his work. Spain government said PM’s security was never at risk, adding that death threats are constant. In recent years, Spain has had a devastating economic crash, an influx of migrants and corruption scandals that has left people fed up with politicians. Although the country has had its own brush with Islamic/foreign terrorism in the past decade, but internal conflict caused by the far-right side has done more harm than any alternative. This isn’t the first or the last assassination attempt against the prominent politician including the Spanish Prime Minister. However, in the past one, such an attempt succeeded. It was attempt against former Spanish Prime Minister Admiral Luis Carrero Blanco who was assassinated. If any such an attempt is fruitful, then it would lead to political vulnerability, chaos and diminish the growth of the nation and region. The frequent assassination attempts against the head of the country in Spain and around the globe demonstrate that regardless of all the advanced security measures, law enforcement agencies still struggle to find the key to eradicate violence. Use of conventional investigative tools falls short of task to find lone wolves in this extremely challenging riddle to identify the perpetrator before an attack becomes successful. Lone wolf criminals are a nightmare for police and intelligence communities as they are extremely difficult to stop. To disrupt their plot, law enforcement and intelligence agencies need valuable intelligence: an informer with knowledge of the plot, intercepted communications between the plotters, etc., and if only there was one-stop solution to fit the bid. Spanish law enforcement agencies might have thwarted this assassination, but it doesn’t provide assurance that future planning and plotting against prominent politicians won’t occur. An arrest of one perfect and most capable lone wolf wouldn’t be effective unless law enforcement personnel can gain timely and precisely accurate information about the involvement of other individuals or groups. However, this is impossible through existing conventional investigative tools. But now, national security forces around the globe can take advantage of an advanced forensic technology that is safe, virtually unbeatable, clearly the most accurate, respects human rights and most importantly reveals all the critical information a lone wolf is trying to conceal with over 99% accuracy within an hour. Before a new individual plan to assassinate the Prime Minister of any country, the advanced iCognative could provide the most authentic, accurate and tenable solution to this recurring problem. iCognative is a one-of-a-kind technology available in the security market that recognizes the vital difference between the perpetrator and an innocent is the recognition of the specific crime-related information stored in their brain. The confidential information related to initial stage of planning would only be present in the perpetrator’s brain even before they execute their plans. No existing conventional investigative tool can ever offer such essential features necessary for the law enforcement personnel to apprehend the perpetrator even before they harm other people. iCognative technology not only supports law enforcement agencies to find vital evidence, intelligence and lead to prosecute a lone wolf but identify the other hidden known/unknown accomplices before they could strike again. A 45-minutes iCognative test when utilized by Policia Nacional and other Spanish law enforcement agencies on Manuel Murillo Sanchez rapidly delivers time-critical, valuable and accurate intelligence related to the assassination plot and group involved if any. 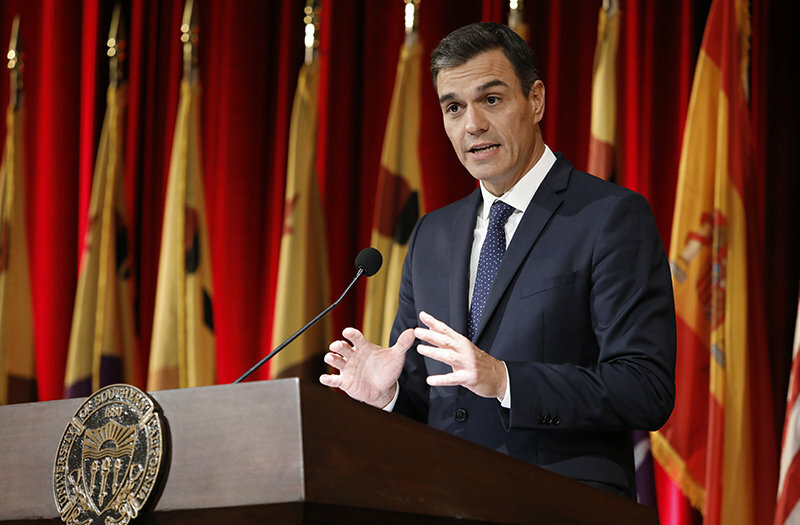 His long-term alignment with far-right groups that may have plans to disrupt political stability and plans to create anarchy in Spain that might be in the pipeline can all be averted. The assigned investigator uploads all case-related information including confidential crime-related information known only to the perpetrator into the iCognative system protocol to conduct a test. Investigation details uncovered during the investigation such as: detailed plot of assassination of Spanish Prime Minister Pedro Sanchez, type of weapon found, execution plans, location of the assassination, identification and location of other suspected far-right members, etc., can be utilized as Stimuli to conduct a test on Manuel Sanchez. The iCognative system records and analyzes brainwave responses to each specific crime-related information and determines with over 99% accuracy if the information under question is present or absent in the brain of the suspect. This technology is so reliable that no matter how well-trained or smart a perpetrator is, he/she can’t deceive this technology in any way possible and if the same test is repeated on a suspect hundred times, iCognative would provide the same results every time. The science utilized by this technology is patent-free P300/P300 MERMER, P300 differs from traditional “question and answer” lie-detection in that it doesn’t rely on the fight-or-flight nervous system to moisten palms and quicken pulses – signs some experts say catch lies with an accuracy little better than chance. iCognative by Brainwave Science is the perfect forensic technology a must-have tool in arsenal of law enforcement agencies around the world as it provides the essential key to prevent a crime, something that is long overdue. iCognative is the most in-demand scientific technology around the globe as no perpetrator, irrespective of his skills or training, can ever cheat or beat to this one-of-a-kind technology.